As for me? Well its a rare year when I don’t don a costume and go out and get my drunk on, but tonight, I think I may just sit on my front steps and watch the parade of 500,000 costumed revelers marching by. Maybe with Bunny Ears on. Or a pirate hat. Or maybe my Wonder Woman costume’s red cape. Who knows where the wine will take me my fiends! 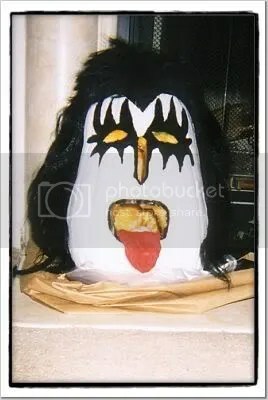 -Your Gridiron Goddess, that is GeneGene the Pumpkin King below, my Halloween 2003 Pumpkin. I am taking tonight off! I’ll be back tomorrrow! That is my NFL wrap up my fiends! Thanks Brett Favre and the Packers for pulling out the win and making it all possible for me. I’ll be out of town next weekend attending my high school reunion (gulp). Am not sure how much access I will have or how much time I will have to update the site with scores and goings on of games on Saturday and Sunday. I’ll be putting both my College and NFL picks up before I leave at lunchtime Friday. I just need someone who wants to and can commit to updating the site with scores on Saturday and Sunday. Comment or email me if you are interested. Congratulations to the Boston Red Sox and their fans! 2007 World Series Champions! I am 5-1 on my KROQ NFL picks and 1-1 on my KROQ College picks tho! More update on NFL after MNF! Now, back to watching the World Series for me. Go Sox! Well I said I was either going to be a football genius or crash and burn spectacularly with my CFB picks, did I not? I went 10-8. Sigh. Yes, my Trojans lost again. I didn’t expect them to lose but I didn’t expect them not to lose either. I tried firmly to just not think about it. HEH And my way of dealing with it is to run away from the internet and this site for 24 hours. But I’m back. 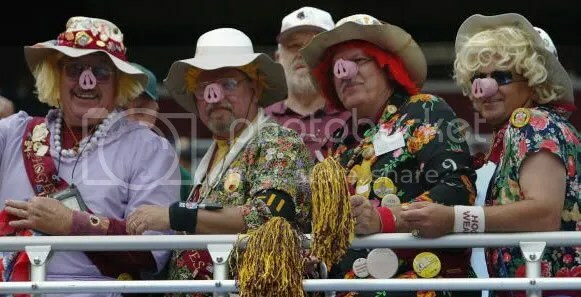 And oddly, I thought SC looked good yesterday, despite the loss. They hung in there. Were it not for a few mistakes, perhaps the outcome would be different. Oh well, there’s always next year, right? Florida bit it in the World’s Largest Outdoor Cocktail Party matchup against Georgia. I think Florida fans and SC fans are in similar boats this year. There’s always next year Gators! Tebow is only a sophomore after all. Solid. Tim Tebow was playing with a sore shoulder yesterday, that is the Gator’s excuse and I can live with that. South Florida lost to UConn cementing the thoughts of OVERRATED in the minds of many. I correctly predicted both here and on KROQ’s Kevin and Bean show the demise of UCLA against Washington State. And of course Ohio State beat the Nittany Lions. I just wish they hadn’t. In the new BCS standings Ohio State and BC are still 1 and 2. LSU and ASU are 3 & 4. Oregon is #5. South Florida, USC and Florida come in at 18, 19 and 20 respectively. For all the flack that the Pac-10 gets, we’re the conference with 2 teams in the top 5. You are currently browsing the Gridiron Goddess blog archives for October, 2007.